Extensions and loft conversions are a fantastic way to gain extra space in your home but all that extra glazing requires clever window treatments, in the form of blinds. Although blinds add an extra cost to your project, they’re a crucial element, shading the room and enhancing the decorating scheme. In an extension, blinds will cut out the harsh glare and prevent furnishings from fading due to the sun’s UV rays. And in a loft bedroom, the right blinds will block out light and prevent the room overheating so you’re sure of getting a good night’s sleep. Read on to find out about window treatments for your loft or extension roof. Find more window treatments ideas on our dedicated hub page. Find out more about extending and loft conversions, too. Ready made or bespoke roof blinds? Off the peg blinds come in sizes to match the window brand – just locate the window code, usually found somewhere on the inside of the frame, and you can order a blind and be sure it will fit. Blind companies have online video guides advising how to install them. If you can’t find the window details, measure the glass and blinds can be made up to suit. Although you’ll pay more for bespoke blinds, there’s far more choice in type, style, colour and pattern, plus you can arrange for them to be installed and avoid the hassle of fitting them yourself. Which type of blind will suit your windows? Roller blinds are the simplest solution yet they’ve a lot going for them. Discreet yet chic, they’ll keep out the sun and protect against glare. Select white blinds to blend seamlessly with the ceiling or wall, or go for colour and pattern to make a statement. Pleated blinds have a softer appearance than rollers, allowing light through. Those with single pleats such as Plissé are supported by wires running across the blind. Blinds with double pleats such as Duette have a honeycomb design, trapping air between the two layers for an insulating effect, helping to keep the room warm. Pleated blinds come in a wide choice of colours, patterns and textured finishes. Venetian blinds are a great choice for any room and aluminium roof blinds are particularly good for bathrooms since they’re moisture resistant. Open them fully or just tilt the slats as the day progresses to shade the room. Look out for designs with a special coating on the concave side of the aluminium slats to keep out the cold in winter and reduce heat in summer. Roman blinds, which fall into large soft pleats when closed, bring an extra element of furnishing to a room. Select semi-transparent or opaque fabrics. 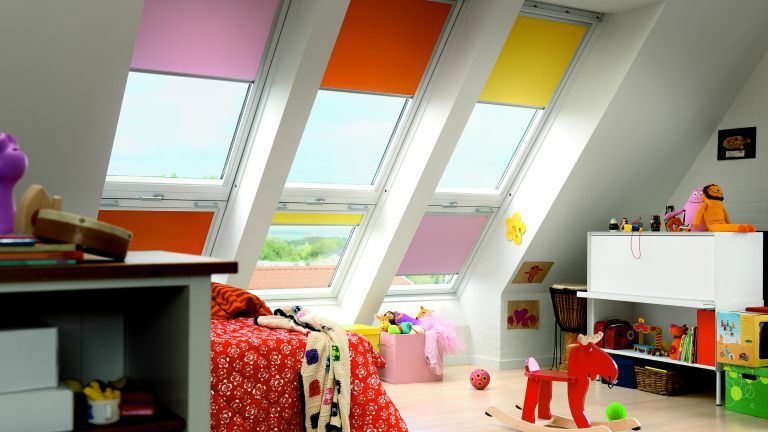 Velux’s range comes in a choice of 20 fabrics. Pinoleum blinds are the natural choice and have long been popular for conservatories. Made from fine strips of wood, woven together, they’re available in a range of colours and create a soft, dappled light effect. Blackout blinds are a must for light sleepers. They have a coating that prevents any light transferring through the fabric. If the blind is fitted within a cassette and frame, side rails block light from sneaking around the edges, ensuring complete darkness. On pleated blinds, the honeycomb structure is lined with aluminium to reflect heat, keeping the cold out as well as the light. For a more flexible option, consider a two in one blind such as Velux’s Duo system, which includes a white pleated blind as well as a blackout blind in one unit. And, of course, match with blackout curtains. Awning blinds, made from polyester net, fit to the outside of the window but are installed from inside. Fit them to cut excessive heat from the sun, while still allowing light through. Insect screens will keep those buzzy summer visitors out of doors where they belong. They’re transparent and can be combined with other blinds. Roller shutters fit to the exterior of the windows, protecting the room from heat and providing total blackout. Which blinds to pick for flat roof windows? Roller and pleated blinds can be fitted to flat roof windows for a neat solution. A solar-powered awning blind, which sits between the dome and the glass, is an option for a room that gets too warm. Where there’s a larger expanse of glass to cover or a raised lantern with lots of awkward angles, you’ll need a blind that spans the whole area at ceiling height, either fixed within the roof window recess or mounted to the ceiling. The blind fabric is held in tracks either side, and support wires under tension ensure there’s no sagging. Traditional conservatories have substantial frames, so fixing roof blinds is not a problem. In a true glass box extension there’s no frame to fix the blinds to, but if the extension has structural support at the ends, the blinds can be fixed to this, or attached to a slim additional framework. The blinds can run on tensioned cables, with the mechanisms discreetly hidden. For windows that reach up into the apex of the roof, a pleated blind can be attached to the angled top of the window which will fan out when lowered. Bottom-up blinds running on support cables can also work well. Among the alternatives are shaped Venetians, triangular roller blinds or shaped shutters. Vertical blinds can run on an angled head rail with vanes at different lengths to fit the window. Find out more at Grand Design Blinds. How do you operate hard to reach blinds? The low-tech answer is to use a telescopic control rod. Find one at Blinds2Go. Motorised blinds, either electric or solar-powered, make life easy. They can be controlled remotely by a wall switch or via a smartphone or tablet using an app. Blinds can also be hooked up to a whole house automated system, with sensors opening and closing them according to daylight levels. Or you can put them on a timer to suit your daily routine. If you’re doing major building works, plan them in as part of your building schedule, so that any cables can be routed into the walls by the electrician.